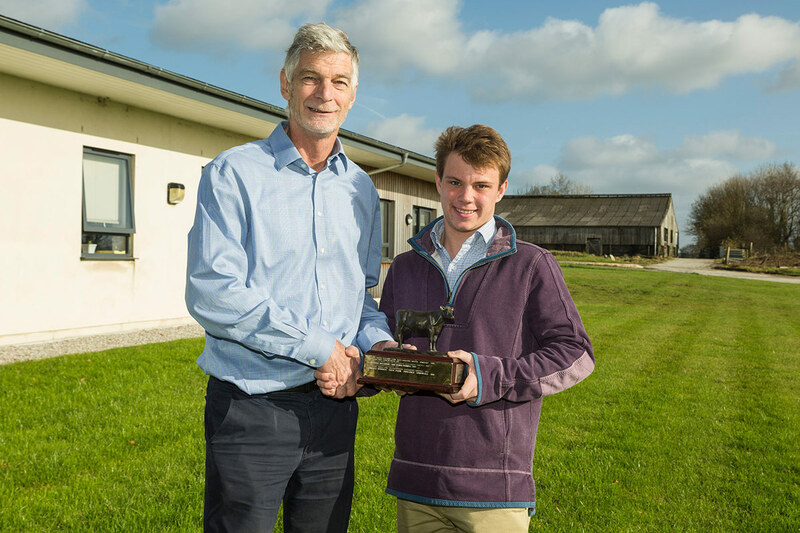 Jack Elworthy, a final year honours student studying Agriculture at Harper Adams University, has won the prestigious West Country Dairy Award for 2017. Established in the 1930s and supported by Dairy Crest and the National Farmers Union, the West Country Dairy Award provides £15k of educational funding for those in the dairy industry across Cornwall, Devon, Somerset and Dorset. Bill Clarke, co-founder and chairman of Glynn valley based Trewithen Dairy, has interviewed every Cornish applicant to the charity for over 20 years. (Except in 2006 when his son Francis Clarke, now MD of Trewithen Dairy, won the top award that year). He praised Jack for his understanding of the technical issues facing dairy farming, his high level of motivation and clear vision for his future career. We caught up with Bill Clarke and Jack Elworthy in two separate interviews. Bill, what impressed you most about Jack’s application? Jack has a very good grasp of the technical issues that are so important for dairy farming. This combined with a highly motivated and clear vision of what he wants to achieve in his career in dairy farming, including how he will do it. Has a Cornish student previously won the West Country Dairy Award? I have been interviewing all of the Cornish applicants since 1996. Since then there have been eight top student finalists like Jack, so we have had more than our share of winners. Over the last 20 years what changes (if any) have you noticed about the standards of applicants for the WCDA? Apart from the early naughties when we had a dearth of applicants, the general standard technically has been reassuringly good. However, the most significant change is the increase in professionalism of applicants as they reflect the need for farmers to be more accountable for environmental, quality and welfare standards. What are the challenges facing dairy farmers today and how have they changed over the years? There is a multitude of technical advances available to farmers today and these must be optimised to deliver efficiency and quality. They also play an important part in delivering the reassurance that consumers demand about the standards on farm. However, I still think that the most difficult part is delivering the change in culture and the quality of people that make for the best management. Hi Jack, congratulations on receiving this prestigious award! In your application to the West Country Dairy Award you stated that you were not from a farming background. So what is your background and what first interested you in dairy farming? My parents both work in restaurants and I grew up in a hotel, so I guess my background is in hospitality. When I started out working at the farm I was 14 and it was just a job to earn some pocket money. I soon discovered that I totally loved working with the cows and being outside. How did you realise that Dairy farming was what you wanted to do? After my A ‘Levels I took a couple of year’s out to go travelling In Australia to get some more work experience. While there I worked on a 5,000-acre farm with 800 milking cows and that’s when I realised I wanted to pursue my career in farming. I hadn’t planned to work on a dairy farm, it just happened. What have you learned most from farm work? To take every opportunity given to you and try to learn as much as you can. Have an open mind and always be willing to lend a hand. At Leyonne Farm, I learnt about strip grazing systems, measuring grass, assessing pasture for paddock sizes and helped to run the farm whilst owners Martin and Bridget were on holiday. I’ve just spent my industrial placement working at Ilchester Estates in Dorset, one of Velcourt’s flagship farms, with over 1,100 dairy cows, 500 beef stores and 1,200 ewes, as well as a Higher Level stewardship scheme. Working on a large-scale farm has been fascinating, with all the state of the art equipment. I’ve learnt a lot about how Velcourt manage their farms, in particular the application of new research to benefit the animals and the business. What interests you most about dairy farming? Working with the cows foremost, but also the business element – trying to run a profitable business whilst keeping the cows top priority and looking after them. The two go hand in hand. What do you know about Trewithen Dairy? The first farm I worked on supplies Trewithen Dairy with milk. I like their ‘happy healthy cows’ philosophy. They have a two-way relationship with their farmers and are equally concerned about the quality and provenance of their milk. You’re just finished a work placement year at Velcourt Dairy and are now studying your final year of Agriculture at Harper Adams University. What are the biggest challenges you have faced as a student thus far? It’s tricky maintaining a healthy balance between enjoying yourself and getting on with your work. There’s a lot of pressure, so you need to be very organised and keep the momentum going. Martin (at Leyonne farm) was a big inspiration for me – he works very hard, has had success, but also enjoys life and spends time with his wife and kids. He has a good work / life balance. What advice would you give other teenagers who don’t know what they want to do in life? Go out there and try things even if it’s out of your comfort zone, because you never know whether you might like it or not. Also don’t rush to make a decision. I took 2 years off before my degree, so sometime you fall into things. Is it possible for Dairy farming to be ‘just a job’ or does it be a passion? It has to be a passion because of the hours. To be successful you have to love what you are doing. With cows you are on call 24/7. How do you see the future of the UK Dairy industry? I think it is facing tough times ahead with Brexit. But I am hopeful that it will come back strong and UK dairy farming will become more self sufficient, rather than exporting / importing a lot. How will you use the West Country Dairy Award scholarship? The scholarship will help ease the financial pressure on me and enable me to purchase books and additional course material. This will allow me to enhance my core skills and research new ways of using animal husbandry. Specifically, I’m looking to improve my skills by taking a foot trimming course and an Artificial Insemination course. What’s next for you and what do you want to do in the future? I’ve got my dissertation next which focuses on ‘the economic, social and environmental benefits of managing spring-calving dairy cows on different wintering systems’. Then I’ve got my exams. After that I’m applying to go to New Zealand to look for jobs working out there. My long-term goal is to become a top-rate farm manager, capable of running a farming enterprise efficiently and profitably. Owning a farm is unlikely, as I’m not from a farming background, but becoming a share milker or tenant farmer really interests me. I want to invest my own money and have my own business rather than working for other people. It sounds like you’ve got a busy time ahead of you. Do you have any time for interests outside of dairy farming? I love watching sport and playing squash, rugby and football. Oh and socialising with friends! Thank you Jack and good luck for the future!